GrumpysPerformance.com • View topic - Which One......A/F Ratio or Infrared Thermometer ??? Which One......A/F Ratio or Infrared Thermometer ??? If you had $200-$300 to spend on a new tool, which would you buy first.........Air/Fuel Ratio Gauge or a Infrared Thermometer ??? The IR Thermometer would be more versatile since you could use it on many vehicles and no installation. The information coming from the A/F meter would have much more detailed data. Are there some other pros for the A/F gauge over the IR ??? So which one would it be if it was you ??? Re: Which One......A/F Ratio or Infrared Thermometer ??? I guess Id have to say the IR thermometer simply because Ive had and used it for years , I bought an expensive F/A gauge but only had it a few months before it stopped functioning, but probably because Im reasonably good at reading plugs to diagnose f/a ratio issues, I was not all that upset, other than the waste in money for a defective tool.. I see it as being a lot more flexible in it's application and therefore more useful if you can only buy one tool. But I have never owned either one, so I was looking for other perspectives.............Thanks!!! I have a dual wide band O2. If it still works (I'll be using it in a few weeks) I can send it over to you when you need it. DorianL wrote: I have a dual wide band O2. If it still works (I'll be using it in a few weeks) I can send it over to you when you need it. That's most generous Dorian. I will let you know when I get close, but it won't be until this summer. So no rush on my part at this time. I am getting closer (5-6 weeks) to starting on the 200-4R, have you had a chance to mail the manual ? No prob - I hardly use the A/F. So no sense in you buying one. As for the other book... my wife "put it away" and temporarily lost it. I found it back last night while I was searching for my pacemaker that she also put away... I haven't found that back yet. I'll send you the book tomorrow. Promised! The seals are what I consider the toughest part... The old ones are worn and slip very easily in there. Getting the new seals in there without folding them over or cutting them is tough! DorianL wrote: The seals are what I consider the toughest part... The old ones are worn and slip very easily in there. Getting the new seals in there without folding them over or cutting them is tough! There can only be one or two o-ring seals right Not to worry, but just in case, did you find a trick to getting them in ? DorianL wrote: No prob - I hardly use the A/F. So no sense in you buying one. Well if you would take care of your heart, like you take care of your hands......you wouldn't need a pace maker. Either way, don't take out a big life insurance policy on yourself or your wife may step up her efforts ! Lololol - by pacemaker I mean my heart rate monitor. I keep track of my pulse when running and vary depending on the day. I run three times a week a few miles and weight lift four times a week. I take care of everything... not just my hands. I even eat six times a day counting every calorie and every gram of fat, protein and carb. My question is while the engine is idling ,if the led lights go out am i running too lean? I have read some where that the sensors are only good for WOT readings, so a little confused on what they are to show at idle and cruise. The wide open readings , like getting on the highway,are showing the leds lit up to the light in between the 13 and 14. As I get up to speed the lights will go all out again." can you post REAL CLEAR PICTURES of all 8 spark plugs labeled as to the cylinder they came from? whats your ignition advance curve? what did you set the initial timing at? whats the plug gap set at? BTW, my wide band O2 still works... VERY nicely. Im going to have to buy a newer version of the A/F ratio meter once my finances allow. 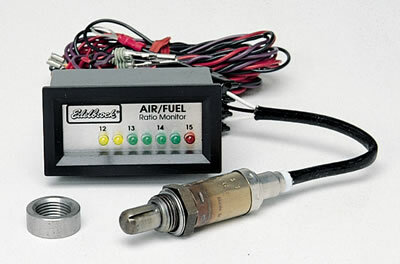 grumpyvette wrote: Im going to have to buy a newer version of the A/F ratio meter once my finances allow. Be sure and let us know HOW you decide on which one to purchase. Really my advice is the LM-2, because it also log the RPM(other unit does not) that is a hudge help when trying to tune. mathd wrote: Really my advice is the LM-2, because it also log the RPM(other unit does not) that is a hudge help when trying to tune. I have an LM-2 and you can do a lot with it because it has 4 analog inputs you can use for other things like RPM, vac, tps and secondary opening in relationship to the AFR.